The Dow rose to an all-time high Wednesday as investors focused on mostly solid corporate earnings. The Dow gained 126 points to surpass its record high from last week. Microsoft (MSFT) and Chevron (CVX) were the best performing blue-chips in the Dow 30. Nike (NKE) and Home Depot (HD)were among the few Dow components that were lower. 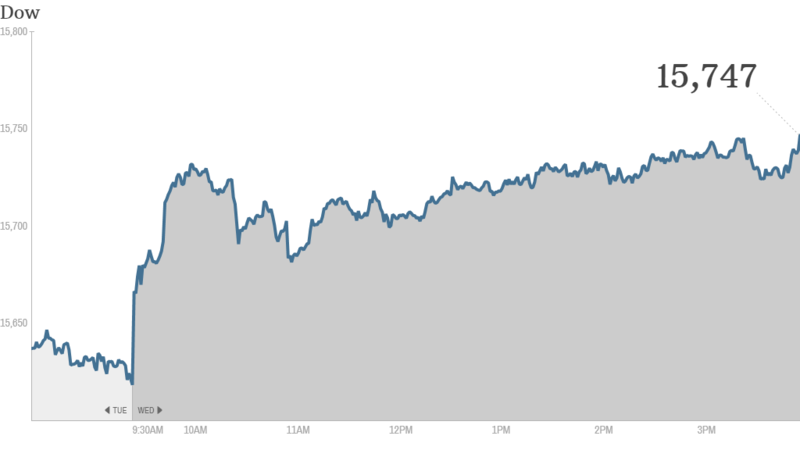 The S&P 500 ended just below its record high, but the Nasdaq dipped. Stocks ended mostly flat Tuesday. Health insurer Humana (HUM) reported better than expected earnings before the bell. CNNMoney parent Time Warner (TWX) topped earnings forecasts and reaffirmed its guidance for the year. Of the 374 companies in the S&P 500 that have reported earnings so far, 69% have topped analysts' expectations, according to S&P Capital IQ. "That's a nice clip to run at," said Bill Stone, chief investment strategist for PNC Wealth Management. Tesla shifts into reverse: Tesla (TSLA) shares plunged after the electric car maker's third-quarter results were not as strong as investors were hoping for. It's been a bumpy ride for Tesla. At its peak in September, the stock had quadrupled in price. That prompted many investors to take profits in October. But some StockTwits traders welcomed the volatility. "$TSLA You just need to sell it when it runs up a lot and buy it when it drops a lot ...depending on scenario, but it's a great trading stock," said scherf_com. 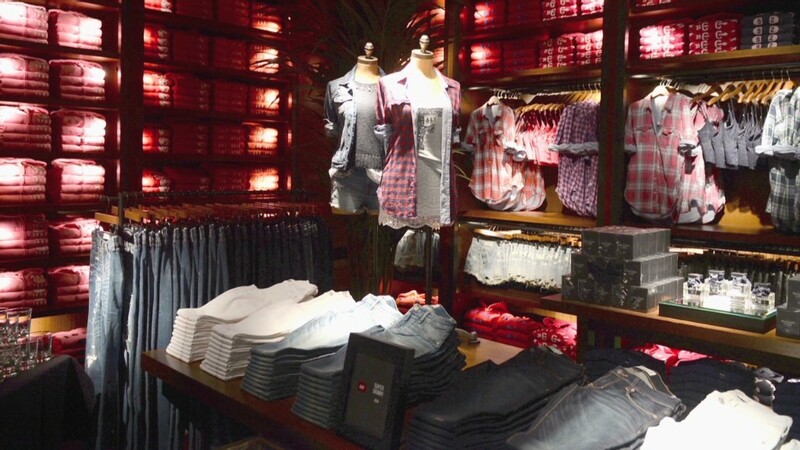 Shares of teen apparel retailer Abercrombie & Fitch (ANF)tumbled 13% after the company warned of weak sales and said it was closing its lingerie chain Gilly Hicks. The warning was evidence that Abercrombie is losing its appeal with an often fickle demographic, according to one StockTwits user. "$ANF my teen daughter and her friends say that ANF isn't cool anymore," said ipoguy. Shares of OpenTable (OPEN) surged 12% after the online restaurant reservations company reported record revenues late Tuesday. "$OPEN another great stock, of course its overvalued but it certainly is a great app," said ccash04. Icahn's next target: eBay? Shares of eBay (EBAY) gained on rumors that activist investor Carl Icahn is considering a stake in the online auction company. Icahn recently increased his investment in Apple (AAPL) and sold a big chunk of his position in Netflix (NFLX). "$EBAY Carl Icahn? Is he buying shares in every Tech co now?" asked Lach14. CBS (CBS) reported strong quarterly sales after the market closed. Shares of Whole Foods (WFM) sank on a disappointing outlook. SolarCity (SCTY), the renewable energy firm chaired by Tesla CEO Elon Musk, reported a smaller-than-expected loss and sales that topped forecasts. Twitter mania! Investors will also keep tabs on Twitter (TWTR) once the market closes. The social media site, which has more than 230 million users, is widely expected to price its initial public offering this evening and begin trading on Thursday. The IPO market has been booming as stocks trade near all-time highs. The S&P 500 has gained 24% so far this year, extending a bull market that started in March 2009. Barracuda Networks (CUDA), which provides cloud computing and network security services, priced its IPO at $18 a share, the low end of its price range. But the stock jumped more than 20%. Avianca Holdings (AVH) and Arc Logistics Partners (ARCX) also went public Wednesday but did not fare as well. Looking ahead to the rest of the week, investors are awaiting the U.S. October jobs report from the Bureau of Labor Statistics. The report, due out Friday morning, has a strong influence on market sentiment. Investors are zeroing in on the economy as they attempt to gauge when the Federal Reserve will begin to slow, or taper, the pace of its $85 billion per month stimulus program. The Fed is expected to stay on hold until sometime next year, but any sign of improvement in growth, particularly in the job market, could stoke concerns about an early exit. "We all know the taper is coming, we just don't know when," said Stone. On Thursday both the European Central Bank and the Bank of England will announce interest rate decisions. The ECB is under pressure to cut rates to a new low. European markets and Asia's stock markets ended mixed.